Made to Order for Clear Water Worm Fishing! 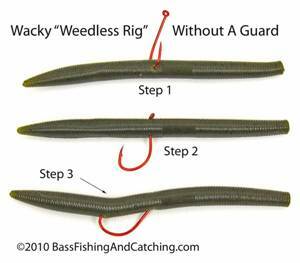 Wacky worm fishing is placing an appropriate style hook in the center of a straight tail worm, without adding any weight, then casting it "to a cover or structure target" in clear water and allowing it to sink slowly to the bottom. That's wacky worm fishing in a nutshell. 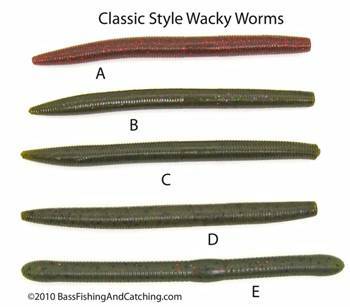 What Are the Best Wacky Worms for Fishing? This is perhaps the most critical consideration for successful wacky fishing. The wacky worm should be a "straight, non-descript worm that has no tail. Those that are manufactured with additives like salt which adds weight and contributes to a slow sink, and I emphasize "slow", are the best choices. In addition to a slow sink, the worm should drop level, with an action subtle almost to the point of no motion at all. It should in essence, drift downward with its ends almost imperceptibly undulating up and down. Don't try and impart action to the worm as it drops. You'll put off many bass that might otherwise strike it. Research and the experiences of many bass fisherman wacky worm fishing shows that most, certainly more than 50%, of strikes on a wacky rig occur on the drop. The wacky rig is one that stimulates strikes based on "sight", not water displacement or sound. That's why it's a clear water rig. Remember also, "be a line watcher"! You accomplish such a drop by casting out your "weightless worm" and after the worm hits the water peeling off plenty of line so it drops on slack line beside the cover you've targeted. Slack line is a very important part of successfully fishing a wacky rig. This enables the worm to appear in the most natural manner as it falls. So, the best worm for this? Tradition says it's the Yamamoto Senko. 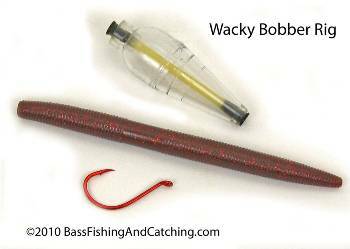 In practice, it can be any cigar-shaped worm be it the (A) Senko, (B) NetBait's Salt Lick (C) Bass Pro Stik-O Worm, (D) Strike King's Ocho (E) Berkley's Heavy Sinkworm, or the YUM Dinger, not shown, just to name a few. I've used all these and they all work well with some subtle differences. I would say that those which are the most limber do perform best as they have built-in action as the ends are lifted and straightened by water resistance through he fall. My experience is that 4" worms tend to be the most productive though many anglers score big with 5" lengths. OK, you've decided on the worm. Now how do you rig it? Weedless or open hook? Best hook for wacky worm fishing? That's hard to say. 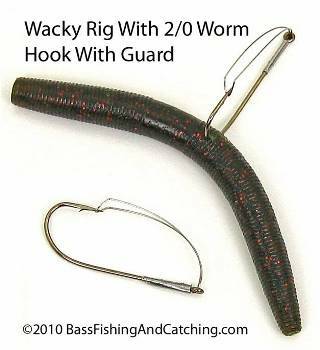 While the wacky worm is hooked through its middle in most every instant, the type of hooks that can be used are varied. Finesse wide gap hooks, shiner hooks, octopus hooks, straight shank, split shot, Skip Gap hook and even weighted when using a jig or adding weight nails. Hey, wait a minute, you just said wacky worming was with "no weight". I know, I know, we'll get to the weight thing later. In most instances a worm rigged wacky will be done so with an open hook. An exposed hook point contributes greatly to good hook ups when fishing a wacky worm. The negative aspect of this is obvious however, it will hang up just as frequently as any other "open hook" rig will when fished around vegetation, stumps and even wooden docks. There are "weedless" choices available as well. If you're wacky worm fishing in relatively open water for suspended smallmouth your hook choice should be one that is "open". Otherwise, gravitate toward one of the "weedless" versions. Gamakatsu has a very good finesse wide gap hook that sports a delicate but effective plastic guard to deflect brush from its hook point. I've used this hook to wacky rig worms with great success around cover. It's also less prone to deflecting hook sets as can stiffer guards. A round bend worm hook with a wire guard is also available from Gamakatsu. Other companies probably offer this as well. Another choice is a straight shank hook fitted with a weed guard, also available from Gamakatsu but from other companies as well. Though some feel a weed guard can interfere with hook sets I feel it really depends on the stiffness of the guard. This one is quick to "give" under the pressure of the bass' mouth. I've not experienced problems with it. When wacky worm fishing in open water I particularly like using a #1, 1/0 or 2/0 shiner hook as seen in the picture at the top of this page. with either a straight or upturned eye. The latter is also good for tying on your own monofilament weed guard though I've found this not to be worth the time and effort. If you need hooks with guards just buy those that already have weed guards and keep life simple. That's how I look at it. 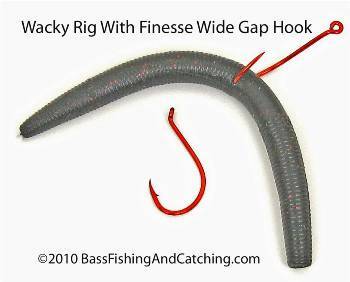 Some anglers just use standard wide gap worm hooks positioning the hook point through the middle of the worm as shown right. This works too. There is a handy little tool available for wacky worms that can contribute to the longevity of cigar worms. It's in the picture at right. 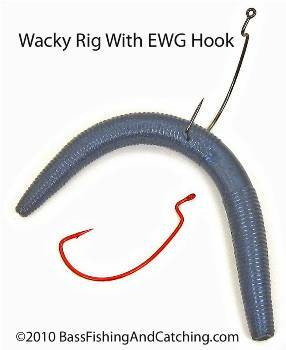 Wacky rigged worms take a beating due to their consistency and the fact the hook is positioned through the worm's center. A position that makes them vulnerable to tearing apart when struck by bass. Below is this tool. It enables you to place an o-ring on the worm under which a hook is placed rather than running it through the worm's body. With the price of plastic worms these days this little tool earns its keep in short order. Merely place your worm in the tube then slide a ring off the tool onto the worm's body and "wa-la". You're ready to slide the hook under the tightly fitted ring and not compromise the structural integrity of the worm. To each his own of course but I find this to be a nifty and money saving little device. I would be remiss if I failed to tell you replacement o-rings can be purchased at your local hardware store in bulk. This set up for wacky worm fishing is new to me. I've provided pictures and a description for readers but I've not tried this personally, though I intend to do so. Seems like a "wide gap" or "octopus" hook like the one shown in the picture would be the best hook as the tip must pass through a good bit of plastic when setting the hook. With your hook attached to your line thread the hook point through the worm body as you would when ordinarily rigging it wacky. Pull the hook through the worm till its eye is at the surface of the worm. Next, turn the worm till the hook point is toward the worm as you would Texas rigging a worm. Pull the eye of the hook into the body of the worm. Remember, your line is tied to your hook. Lastly, push your hook point through the worm till it just barely breaks the surface. Now you're ready for wacky worm fishing "Texas Rigged" I guess. Wacky Bobber Fishing - Just Plain Fun! The ways of wacky worm fishing are not completely unlike Float-N- Fly fishing for smallmouth bass so popular in cold water months in the South. This is a very effective smallmouth technique as well. The reason being that smallmouth tend to feed primarily "upward", not "downward. Something about this rig suspended in gentle undulation five to 10 feet down proves very enticing to suspended smallmouth. It's also a simple rig to put together incorporating a wacky rigged worm, 8-10lb Fireline (or some other superline that does not sink), 8-10lb fluorocarbon leader and a "fixed" bobber. The emphasis here is "fixed", not "slip". Run your Fireline through the bobber. Attach a small ball bearing swivel to the end of this line just below the float. To this swivel tie a 3-8' length of fluorocarbon line. Next you affix your hook and your worm of choice. Add no additional weight to this rig! If you do the worm will not fall as it should. 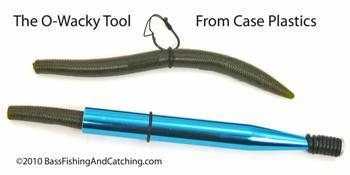 As with the Float-N-Fly a long rod is preferred for wacky worm fishing. A long rod enables long casts if you're using a longer leader of 8-10'. It also facilitates long casts that are important if the water you're fishing is quite clear. So chose a long 7-7 1/2' rod with a limber tip but good backbone which helps drive the hook into the hard surface of a bass' mouth. Hooks - Hook size is a critical aspect of wacky worm fishing. Many of the worms fished as wacky worms are thick. As a consequence it's a safer move to stick with some style of "wide gap" hook. With four inch worms, which I focus on when fishing for smallmouth, I usually use sizes 1, 1/0 and 2/0 Gamakatsu Finesse Wide Gap hooks. Both Owner and Eagle Claw offer similar wacky wide gap hooks too. Regular octopus hooks work well for wacky worm fishing too. Not octopus circle hooks, just the regular octopus hooks. 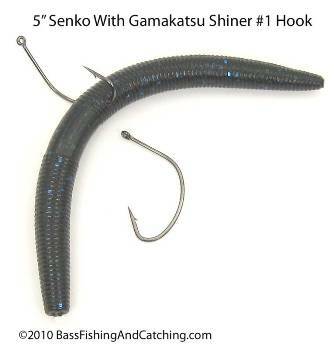 I've also used the straight shank Gamakatsu Worm Hook with a wire guard. For large mouth I'll go with five inchers and move up to 3/0, 4/0 and sometimes 5/0 hooks. Eagle Claw offers these as well. Hook style is also an important consideration. Round bend styles will "sometimes" allow the worm to slide up the curved hook shank to the hook point where it re-embeds itself. This has at least the potential of preventing a good hook set. Line - Light line is the key when wacky worm fishing! The reason? Heavy line creates to much drag and causes the worm to fall unnaturally. That is, the fall is slowed too much. Line that is 8-12lb is the best choice. I prefer fluorocarbon for its virtual invisibility and its tendency to sink. Monofilament is OK but the fact that it floats is a negative for me. I know of some anglers that use 6-8lb Fireline Crystal or SpiderWire Invisibraid with fluorocarbon leaders. As I always say, experiment and use what works best for you. Rod- A 6-7 1/2' medium to medium heavy rod is a good choice for all your wacky worm fishing, except wacky bobber fishing. - A spinning reel is best for wacky worming. Make sure it has a good smooth drag.